This is an entry level sailing program for children aged 7-14 yrs designed to teach kids the basics of sailing and promote the sport in Bali. We use standard Optimist boats which are the most widely sailed boat in the world. For new comers we suggest an initial one hour introductory course which provides the prospective student and their parents a better understanding of the ocean setting and specific challenges of the course. If the student is receptive and wishes to continue we can proceed directly into level one. The full certificated course consists of approximately 30 hours of instruction divided into the initial 15 hours of basics and a second 15 hours of intermediate instruction during which the kids gain practical knowledge and master the skills required to sail. 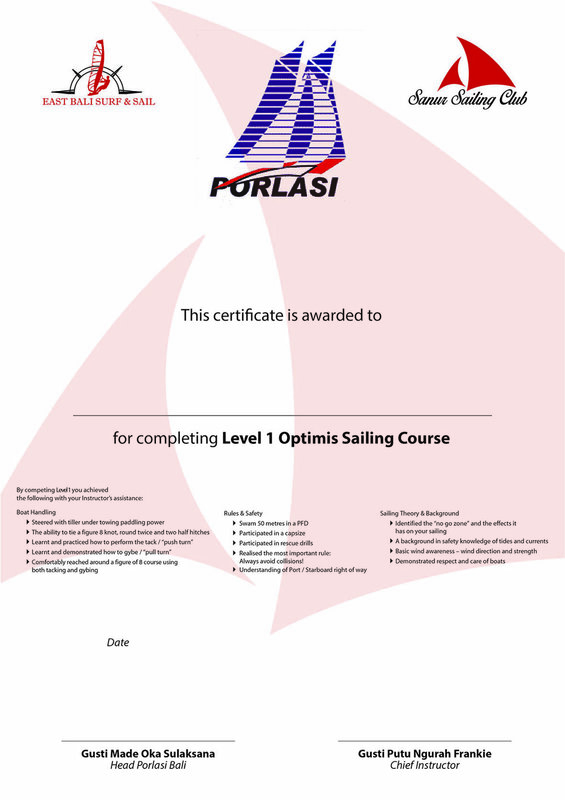 Students are provided with a basic curriculum to study and upon completion of each level are awarded a certificate of completion from PORLASI, the official Indonesian Government sailing authority. (C) Copyright 2015 East Bali Surf & Sail. All rights reserved.